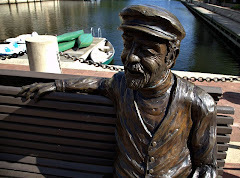 Restonian: News blog from Reston, Virginia, the mauve-colored New Town (tm): Flashback Monday: Welcome to Reston! Flashback Monday: Welcome to Reston! This exciting photo is of the Reston Visitors Center, which was nestled on the shores of Lake Newport. Imagine the excitement of walking into the soaring atrium and receiving a series of informational brochures about the residential developments rising from the earth behind it. The building is now home to a real estate company, which we guess it always was if you think about it. I can remember stopping in that place many years ago. I made the long drive all the way out to Reston to see what the place looked like. It seemed like a nice town, but I wasn't about to commute into DC from there. Little did I know I'd end up living here several years later after an unexpected job change. Did they let you pet the Ebola monkeys when you were there? Why do we still have signs for this place?